In 2013, the luxury industry grew by 4% to cross the bar of $ 200 billion worldwide. At constant exchange rates, the growth would have been 6% (source: Bain company 2013 study). So the more the crisis strikes the world the more the luxury industry performs well. The emerging countries are wonderful machines to produce new millionnaires every year and these people have a high spend in terms of luxury purchase power. According to a study done by Forbes magazine on their annual billoonnaires top list, there are hundreds of people in the world with a budget for luxury goods and services that goes from $12 to $24 million every year. It is a lot of money to spend. Most of this money is used for Real luxury estate, automobile, travels and luxury goods shopping. So luxury brands are facing today the consequences of globalization. They face new markets and new customers who need a new education in terms of luxury. The new generation under 25 years old is also craving for luxury brands yet they do not have the references from the past to help them choose. In the 50’s, when a luxury brand like Dior or Chanel would launch a new fragrance or a new fashion collection, they would have national mainstream media coverage. It would be a national event for the country! These brands seemed exceptional and some how representative of a culture from a sociological point of view. When Dior launched its “New Look”, the French luxury house was categorizing the entire decade in France. The after-war period was looking for a fresh start and Dior offered it. In the 80’s everything seemed possible. There were no limits to imagination and Luxury brands were basically reflecting the extravagance of the “Golden boys” period. Fashion brands like Thierry Mugler would transform their fashion shows into international entertainment super-star show. And for that 1’000 seats concert halls would be the scenery of these catwalks. The 90’s and the years 2000 changed radically the way people would buy luxury goods. Concepts like success, being rich, achievement and even the entire definition of luxury changed. What is a successful life today? Or what proves that “you made it”? These are interesting ideas that place luxury brands at stake. When Jacques Seguela, French publicist, said that “if you do not have a Rolex before the age of 50 you would have missed your life”, this sentence reflected the state of mind of a lost world. What is the typology of a luxury brand customer today? This question became an obsession at many luxury brands administration board meetings. In every communication agency briefing the luxury customer targeted is young (under 35), beautiful, urban, lives in a house that looks like wallpaper magazine and would spend $25’000 for a first class ticket for his or her dog. Well let’s get more precise because we might be looking for an old fossil of an animal that does not exist anymore. At least in the sense we all dreamed. There is a study done by Boston Consultant Group (BCG) in 6 different luxury markets: USA, Brazil, Japan, China, Russia and Western Europe. In this study, BCG spotted 5 types of luxury customers, all experienced crisis differently. They earn around $85’000 annually in developed markets and $29’000 in emerging countries. They are not big spenders for the moment but together they represent 30% of all luxury goods purchases in volume and 20% in value. In the 6 markets studied they represented 115 households. They definitely do not have always the means of their ambition in terms of lifestyle but they are usually very savvy in terms of luxury and wishes to buy brands they love. These kind of customers have an annual income of $170’000 in developed countries and $55’000 in emerging markets. They are actually far more affluents than the established middle class and counts for 25% of all luxury purchases. There are 25 million households in this category across the studied markets. They usually buy fragrances, cosmetics and leather goods. This cluster groups households with an annual income of at least $1 million. There are 6 million households in this category. They spend in total $90 billion every year in traditional luxury like Real estate, watches, travels and automobile. They represent more than 30% of the total luxury market in those markets. 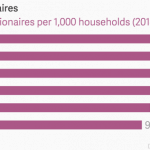 These households have inherit their money and only count for 7% of total luxury purchases. They represent around 1 million households in the studied markets. This cluster represents around 500’000 households. Most of them got rich by being self-made. They have a certain despise of luxury brands as they are simply symbols of feeling part of a successful elite. They buy generally watches, Jewelry, expensive furniture and decorations. Cars also come just behind. They are what we call the “new rich” an evolution of the Bourgeoisie concept. They have a lot of money, aim to spend it but no education on luxury. They will never understand why it takes 9 month to get an Hermès Birkin bag or one year for a Ferrari. They got rich quick and they want to enjoy their money even faster. When luxury brands are suffering because the new generation lost their track, we could naturally blame society, the internet, fate or a rude winter. But at the end of the day, brands are the main responsible. It is all about keeping the brand DNA intact and never compromise on the quality, originality and interest of the creation. In this field, many brands need to review their strategy. When Business analysts started talking to luxury brands, what happened? Well, the value analysis took place and brands started cutting budgets on “little details” that at the end were crucial for the customer. This is when fragrances started being cheaper and cheaper, fashion became a “made in China” story and that jewelry would use cheaper stones. In terms of creativity, luxury brands lost their soul and every luxury brand ad either looks like a coffee advertising or it looks like the other hundred ads. Didi you try to cover the Brand logos and try go guess which brand is which? Very hard to figure it out. Mass-market brands also raised the level of communication and sometimes H&M share the same models, concepts and stories with luxury high-end brands like Dior, Burberry or Prada. How can we expect the new generations to make the difference? Hard. Today it is time for true luxury houses to define themselves as they should be, the proud defenders of quality, know-how, respect of the suppliers, of the customers and of the product. There is a full communication to be done about this and also to renew the aim for the exceptional, the exclusive, the good taste. Enough of me-too products and products without a soul. More than never, luxury houses need to redefine the luxury codes. Only in building a common language with new customers will save the future of luxury. Choices should be made according to state of art rather than profit and sales figures. Companies like Chanel, Louis Vuitton, JM Weston, Cartier or Rolex never compromise on product creation. It is not the case of many others. Info sourced in wikipedia, BCG, Forbes, Wall Street Journal. Featured image represents a Louis Vuitton window – june 2013. It is used for illustration purposes only. All content is copyrighted with no reproduction rights available.